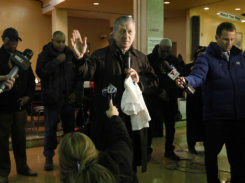 Cardinal Cupich – who was appointed to Chicago in 2014 – is widely perceived as one of Pope Francis’ closest allies in the U.S. Church and has been a strong champion for worker’s rights, immigration, and the consistent ethic of life. 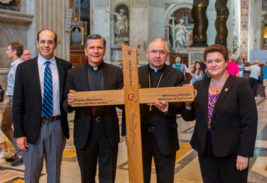 Archbishop Gomez has led the nation’s largest and most diverse diocese since 2011 and is currently the vice-president of the United States Conference of Catholic Bishops (USCCB). He was ordained a priest through Opus Dei, a movement that is widely viewed as having conservative leanings, and has been a vocal advocate for pro-life and religious liberty causes. In recent years he has also become one of the most vocal leaders within the U.S. Church hierarchy calling for comprehensive immigration reform. John Carr, the Initiative’s director, and Kim Daniels, a member of the Vatican’s Secretariat for Communications and a consultor to the USCCB’s Committee for Religious Liberty, are leading the conference, which will bring together 60 select attendees from across the ideological spectrum with the stated goal of exploring ways to help overcome division and to help forge a more unified witness. Carr said Catholics have an unprecedented opportunity with Pope Francis’ leadership to bring Catholic teaching into the public square, but he believes internal divisions among some are squandering that prospect. “We felt there was an urgent need to bring some Catholic leaders together to build bridges across political, ideological, ethnic and ecclesial lines for civil and substantive dialogue,” he said. “More specifically, we want to explore how principles of Catholic Social Teaching can offer affirmative ways to pursue the common good and build unity in our Church. We can’t get distracted from the good that we can do together at a time when our nation needs our principles and common witness,” Carr lamented. “Our hope is that focusing outward instead of inward – as Pope Francis has called us to do, along with Pope Benedict and Saint John Paul II before him – will help us move past some harmful habits and attitudes that too often undermine our work together,” said Daniels. In addition to Cardinal Cupich and Archbishop Gómez, a Public Dialogue will include Helen Alvaré, a professor of law at George Mason University’s Antonin Scalia Law School, and Sister Teresa Maya, president of the Leadership Conference of Women Religious. It will be open to the public. Daniels explained that these individuals were asked to headline the conference as they represent differing ecclesial perspectives, but a shared commitment to serving the common good through the Church’s social teaching. Cardinal Donald Wuerl of the Archdiocese of Washington will celebrate Mass on the opening day of the conference. Along with the organized panel discussions and presentations, both Carr and Daniels said that one of the most critical parts of the summit will be the informal conversations and meals that participants share together and the chance to celebrate the sacraments together each day. In addition to Mass, a penance service will be celebrated, as well as time for individual confessions. “As Catholics we have such a rich and textured faith, so it can be a real missed opportunity when our events are one-sided. We’re looking for a conversation rooted in Catholic principles that’s confident enough to engage on how best to bring those principles to public life,” Daniels added. Daniels and Carr have worked together on several projects in recent years. They recounted the beginning of their own friendship, which has convinced them that personal relationships are critical in forging common ground. When Daniels was being considered for a USCCB position, Carr was suspicious based on what he’d heard about her background. Similarly, Daniels had heard only a one-sided account of Carr’s work. After the two met and began to work together, however, they realized they have much more in common than they disagree on, leading to mutual respect and a friendship that has led them to work together on a number of projects, despite different perspectives on certain matters of policy. In looking ahead to the June event, Carr said that the current divisions within the Church should neither be exaggerated nor minimized. “These disputes do real damage and alienate younger people attracted by Catholic social principles and the message of Pope Francis,” he continued.